Are these the Galaxy S5's specs, or just a specter? A new Samsung phone has appeared online in spectral specs form, and it looks like it could definitely be the Galaxy S5. The handset, model number SM-G900S, popped up in a benchmark test on GFXBench, though it appears it's since been taken down. According to FoneArena, when the listing was live it revealed a Samsung handset with a 2560 x 1440 display, a 2.5GHz quad-core Snapdragon 800 processor, an Adreno 330 GPU, and Android 4.4 KitKat. Nothing else is known about this mystery Samsung phone, but the site speculated that given the resolution it might have a 5.25-inch screen with pixel density at 560ppi, as rumors last month said. Of course there's no guarantee at all that this Samsung device is the Galaxy S5. Considering Samsung has a total of four or five new phones planned for early 2014 already, this could actually be any number of handsets. But even if it's not the Galaxy S5 that we're seeing, Samsung's unlikely to let its flagship Galaxy S series be beat, so the S5 will probably at least match these specs. Other rumored Galaxy S5 features include a possible metal frame, a 64-bit chip and even an eyeball scanner. 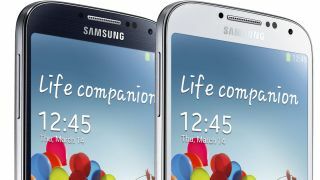 Check TechRadar's Samsung Galaxy S5 release date, news and rumors hub for all your Galaxy S5 needs!